Gettysburg resident John Franklin “Frankie” Riegel was a member of M Company, 3/5 (3rd Battalion, 5th Marines), 3rd platoon, United States Marine Corps. He is standing on the far left in this view. 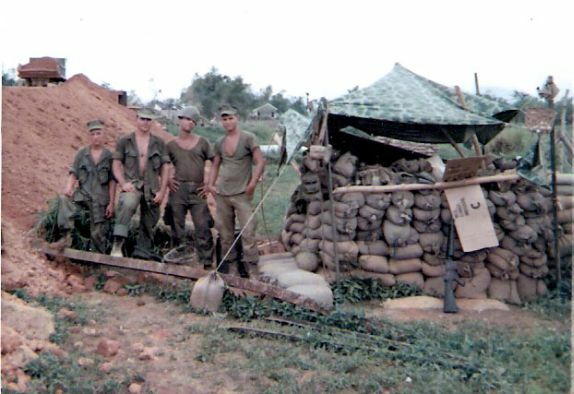 This photograph, courtesy of Fred Permenter, was taken in September, 1967, three months before Riegel’s death in Vietnam. 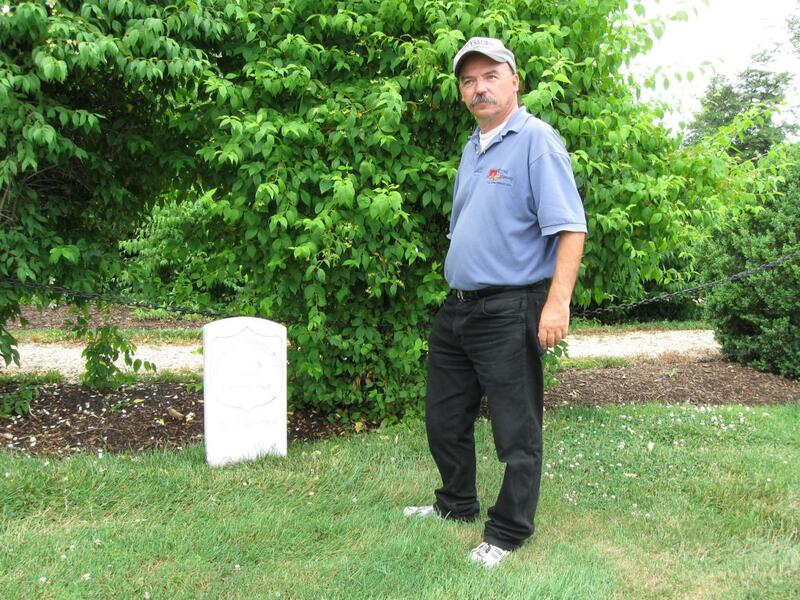 Gettysburg Licensed Battlefield Guide Rich Kohr is standing by the grave of John Franklin Riegel, who lived in Gettysburg when he joined the United States Marine Corps. The Custis-Lee Mansion is in the background. This view was taken facing west at approximately 2:30 PM on Sunday, May 23, 2010. 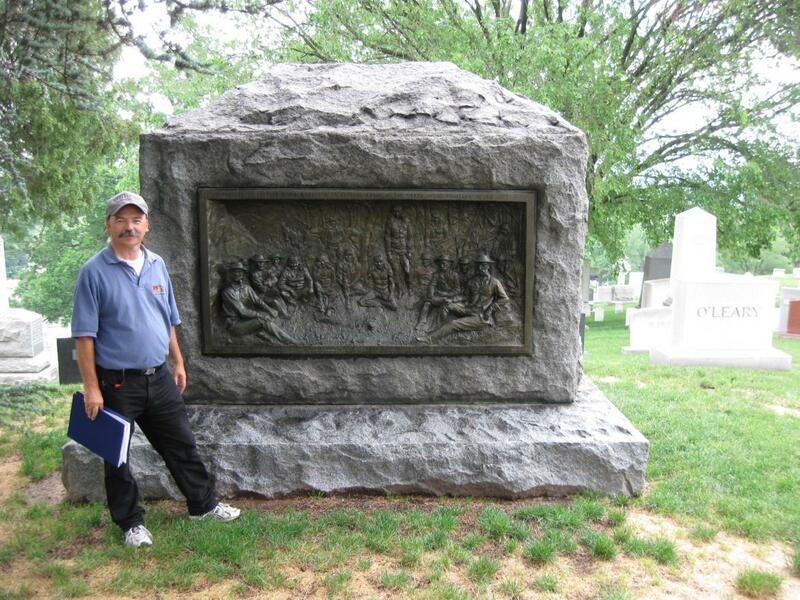 In our tenth Arlington post, Gettysburg Licensed Battlefield Guide Rich Kohr shows us the graves of the son of George Pickett, a Gettysburg Medal of Honor recipient, and the grandson of E.P. Alexander. In the eleventh Arlington post, Licensed Battlefield Guide Rich Kohr showed us the graves of a tank trainer at Camp Colt, and a witness to both Pickett’s Charge and the charge up San Juan Hill. In the today’s Arlington post, Gettysburg Licensed Battlefield Guide Rich Kohr presents the gravesite of a Gettysburg Marine killed in Vietnam, an image of 1st Minnesota Veteran Albert Sieber, and the grave of a member of the 1st Michigan Infantry. This map shows us the locations taken of videos for our Gettysburg at Arlington series. 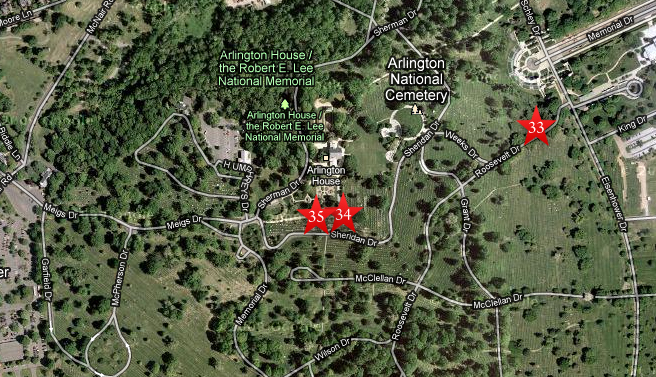 Videos #1-#32 were shown in our previous Arlington posts. Videos #33 was taken at the grave of Gettysburg Marine John Franklin Riegel. 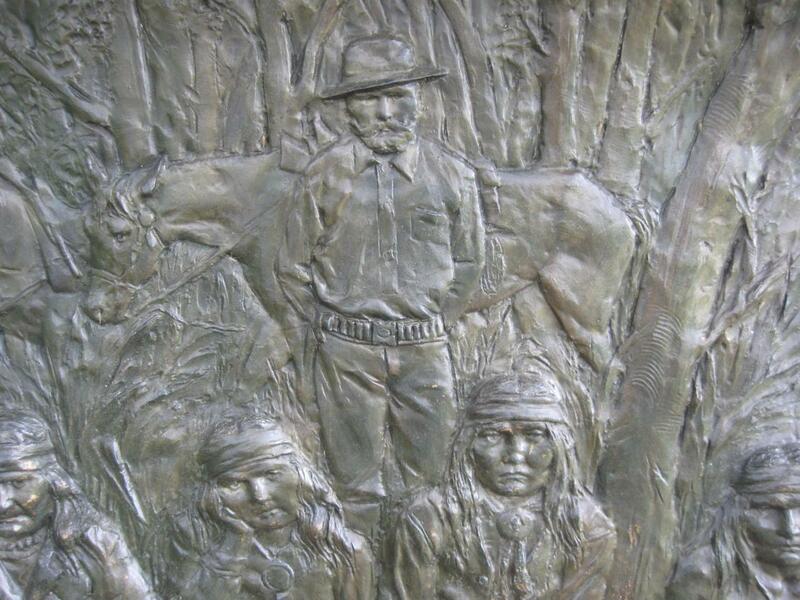 Video #34 was taken at the George Crook monument. Video #35 was taken at the grave of a member of the 1st Michigan Infantry Regiment. This map was created facing north at approximately 5:30 PM on Monday, May 24, 2010. 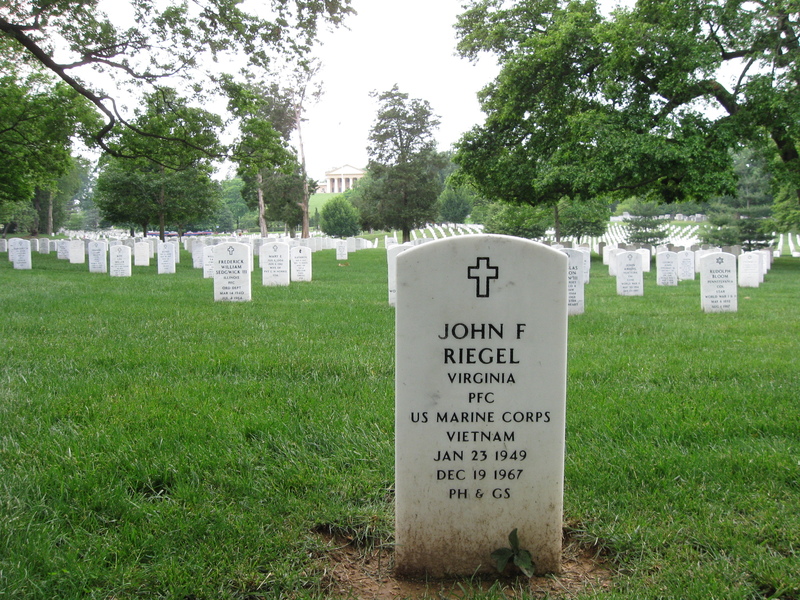 In Video #33 (Videos #1 – #32 were shown in our previous Arlington posts) Gettysburg Licensed Battlefield Guide Rich Kohr tells the story of a Gettysburg Marine who was killed in Vietnam, John Franklin Riegel. This view was taken facing west at approximately 2:30 PM on Sunday, May 23, 2010. A closer view of John F. Riegel’s marker. Others killed in the action that December afternoon were Private First Class Murray Dean Vidler of Canada and Private First Class James Martin Klopmeyer from Illinois. To link to a memorial page for Riegel, Vidler, and Klopmeyer, please click here. This view was taken facing west at approximately 2:30 PM on Sunday, May 23, 2010. Licensed Battlefield Guide Rich Kohr is standing by the gravesite and monument to General George Crook. This view was taken facing east at approximately 2:30 PM on Sunday, May 23, 2010. 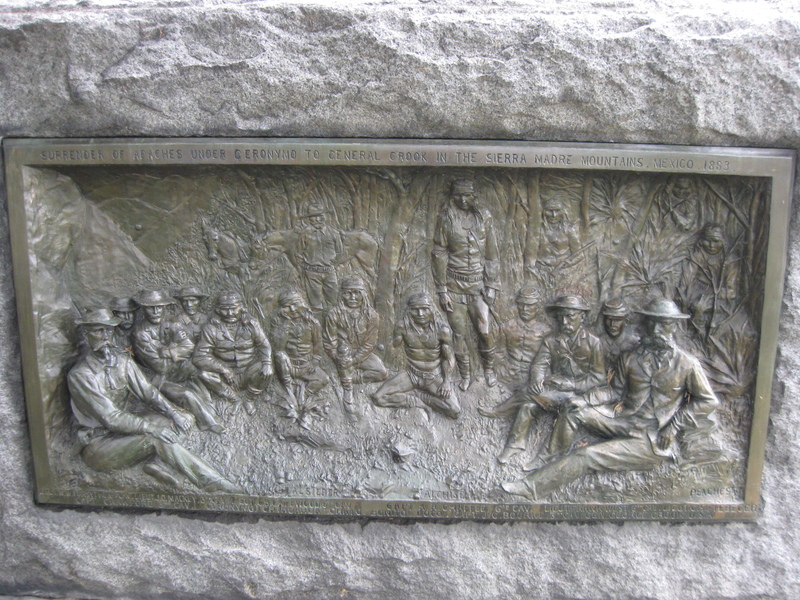 In Video #34 Licensed Battlefield Guide Rich Kohr shows us the bas relief on the Crook monument, and provides background information of one of the men featured on the monument, Albert Sieber. This view was taken facing east at approximately 2:30 PM on Sunday, May 23, 2010. The bas relief on Crook’s monument features at least two individuals with Gettysburg connections. This view was taken facing east at approximately 2:30 PM on Sunday, May 23, 2010. 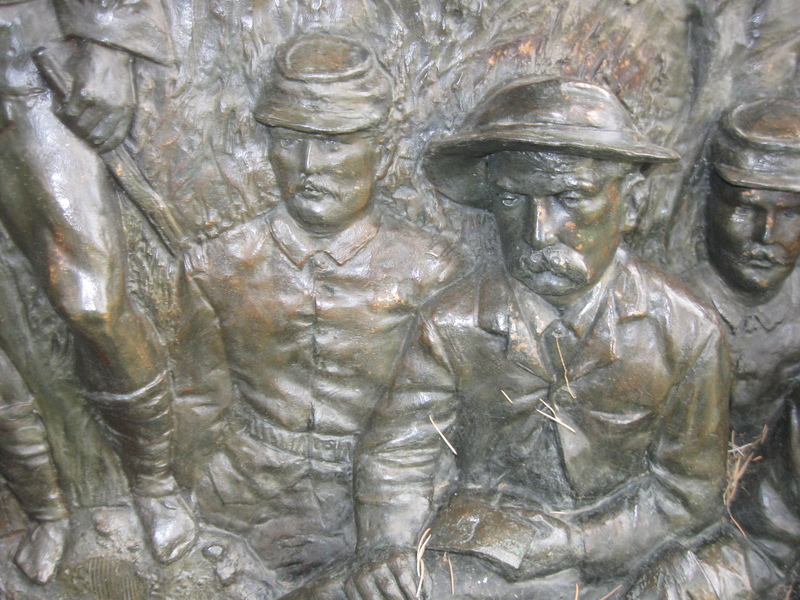 The first Gettysburg connection is Adna Chaffee (1842-1914), shown here sitting, just to the right of the person’s leg, who was a Second Lieutenant in the 6th U.S. Cavalry during the Gettysburg Campaign, and Army Chief of Staff from 1904-1906. 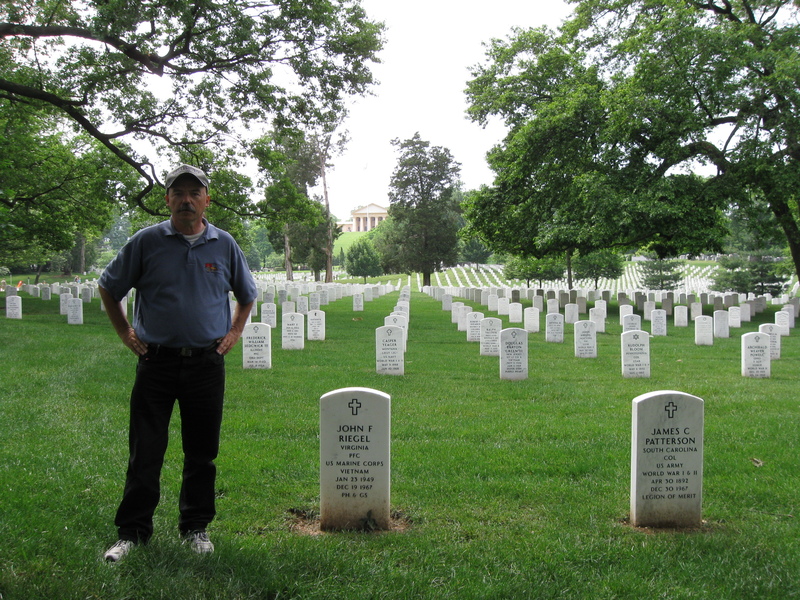 He is buried in Arlington National Cemetery and we showed his grave on a previous post. This view was taken facing east at approximately 2:30 PM on Sunday, May 23, 2010, 2010. … and Albert Sieber (1843-1907), Indian Scout and member of the 1st Minnesota Infantry Regiment at Gettysburg and is buried in Gila County, Arizona. This view was taken facing east at approximately 2:30 PM on Sunday, May 23, 2010, 2010. Rich Kohr is near the site of Mary Lee’s Rose Garden on the south side of the Custis-Lee Mansion. He is standing near the grave of Lieutenant William Woodruff of the 1st Michigan Infantry Regiment. This view was taken facing north at approximately 2:30 PM on Sunday, May 23, 2010, 2010.